Somewhere under all that snow and ice is a bike lane. It’s been three days since Stella dropped its wintry precipitation on the city, but the protected bike lane on Grand Street in Manhattan remains unusable beneath three-foot mounds of snow. The Department of Sanitation identifies Grand Street as a “critical” corridor for snow removal, but that doesn’t extend to the bike lane. While DSNY crews cleared snow from other bike lanes, Grand Street is entirely untouched except for where Citi Bike crews have shoveled out bike-share stations. Most other protected bike lanes are wider than Grand Street, but the city does have vehicles to clear snow from narrower paths. Bike lanes are generally cleared after snow and ice has been removed from streets and roads. When the temperatures drop as they have with this current storm, the Department takes additional steps to remove snow and ice from City streets by piling and hauling it away. As we receive warmer temperatures, Sanitation deploys smaller vehicles such as haulsters and skid steers to attempt to clear bike lanes. This has been made much more difficult by the icy nature of the mounds. For now, the Grand Street bike lane remains snowbound, hardening into an icy mess that’s impossible to bike on. Um, bike lanes are “streets and roads” for people on bikes. Did not get photos but the Eighth Ave lane south of Columbus Circle was in bad shape this morning, complete with snowed-under Citi Bike docks. Still snow banks on every corner. After you make your way through or around those you have to walk around honking box-blocking a-holes “fuming” that they’re stuck in parade traffic. Because the St. Patrick’s Day parade has only been a thing since the 1700s. Gridlock from 72nd Street south, on both sides of the park. At least no one paid a congestion charge. The Bruckner Expressway drawbridge was still terrible last time I checked. I went down Second Avenue to the Manhattan Bridge rather than down Broadway and over on Grand, based in part on this post. But the Chryste Street bi-directional bike lane was also blocked. 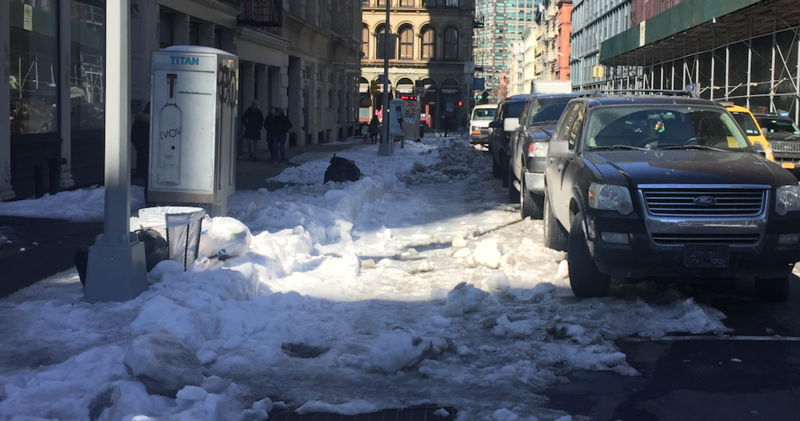 Lets not forget there is the Lower East Side Bid/Partnership, and they are allegedly suppose to take care of the streets when it comes to snow removal. Heavily traveled car lanes are always a priority for snow clearance after a winter storm. The same can't be said for important links in the bike network.